Fluffiest bee award in my garden goes to this tiny Common Carder bumble bee. Even the small cosmos flowers- the last of the season- are sought after. Flowers open smaller as the season winds down. And the bees should surely hibernate soon. Cosmos Antiquity seed- sown in February this year. Still in flower October 19. ← In a Vase on Monday- the view from my potting shed. Thank you. Just an i phone photo in my sunny front garden. What a stunning photo! I’ve been enjoying watching them today too as they’ve feasted on the remains of Persicaria Firetail. Love the vibrancy of this shot! hi Karen, Great photo. Have you upgraded your camera? 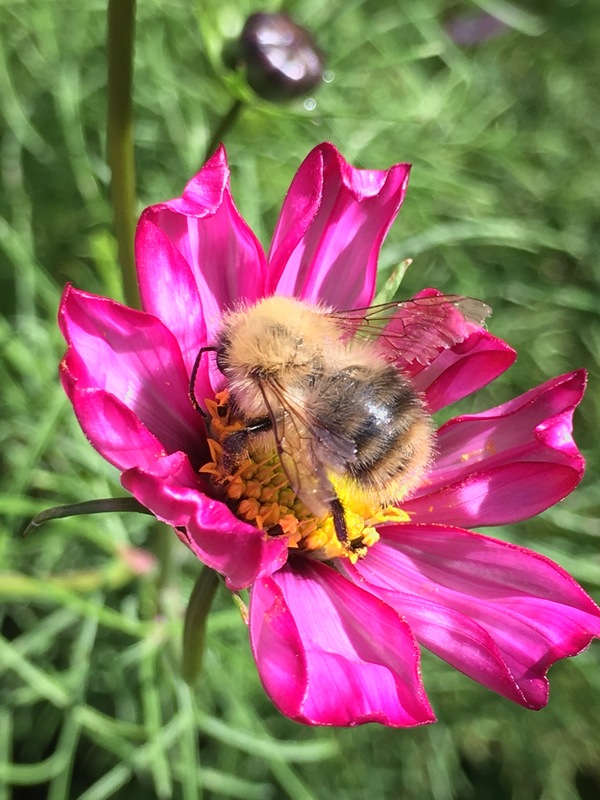 What a cute bee, and a great photo as always! Does that bee use hair gel? Wow! I was taking photos last year, up close with the iPhone. I didn’t realize until I stepped back and checked the image that a bee had photobombed the picture, hovering right next to the Turtlehead (flower) that I was capturing. It was pretty cool! I love that about taking pictures. You never really know what it’s going to turn out like. And I love surprises like yours. Makes me smile too.